Whether you're a lucky homeowner or a very lucky renter, and no matter whether the fireplace that's attached to it works or not, your mantel can be one of the most interesting and creative spaces of your entire home. Designing the perfect mantel is no easy task. And even if you do get it all just right, there's always the occasional update to content with to say nothing of the holidays. But in a lot of ways it's the fact that there are so many options that you're never really done that makes decorating the mantel so much fun. In fact, the range of options is so large that we've pulled together some of the most inspirational mantel designs that we could find, and we're sure that by the time you get to the end you'll agree that we've only scratched the surface. 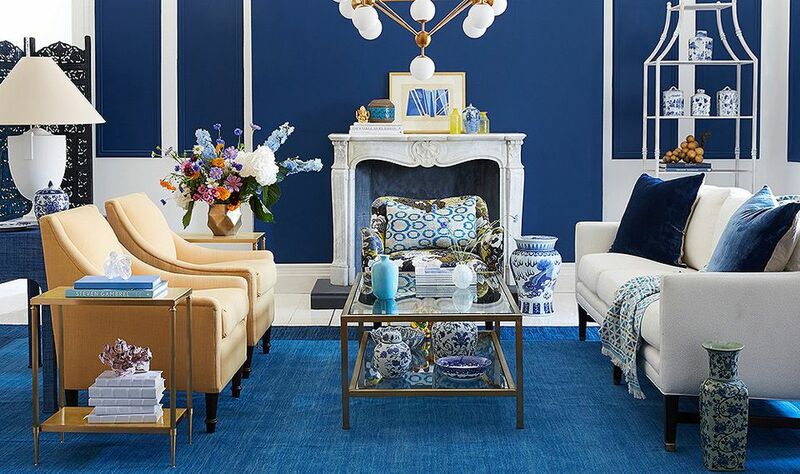 To start us off, this fantastic, contemporary space turns its white fireplace into a pop of color through the daring and extensive use of an electrifying shade of blue. This vignette uses a beautiful echoing of shapes from the large floor urns to the mantel which are repeated again in the mirror. The classic combination of natural elements like branches and candles is a beautiful and simple decor choice that works equally well during the holidays and throughout the year. The mantel is one of the true hallmarks of classic architecture and, as this room, shows, when a room has such good bones, all it takes are a few candles to make it shine. The rough hewn texture of this mantel is accentuated greatly by the ivy garland that seemingly grows along the top and down the right side. With the addition of just a few candles, this is another design that works for the holidays and all year long. The packed dirt floor and stones along the top of the mantel give the room an ancient and venerable feeling. Spring is the time of year for big floral arrangements, lush greenery and weddings. This mantel, adorned with foliage and crowned with a striking array of white florals, is designed with all three in mind. Again we see the beautiful combination of soft candlelight and delicate foliage. The green of the vines pops against the warm neutral tones of the stone fireplace. The mantel is one of the best places in your home for a large luxurious mirror. The brass framed piece in this room lends an elegant air to the entire space. The mantel can be the perfect place to display collection of books, statues and other keepsakes. Look for ways to blend these seamlessly into your decorating scheme. Here the striking combination of foliage and candles is topped with a stunning wreath. Pairing a boxwood wreath with candlelight can create a serene atmosphere throughout the year. A modern mantel landscape with accessories in bright colors. This minimalist mantel space relies heavily on the architecture of the space accented only with a large brass mirror. The chocolate brown wood tone of the mirror frame is a warm pop of color in this cool space. An array of candles can be an enchanting alternative to traditional log fires. A beautiful miniature built in fireplace with lit candles. The minimal mantel display fits perfectly into this modern, neutral living room. A stunning array of vases decorate the top of this stylish mantels. A cozy family room with modern fireplace. Bright metallic accessories warm up the cool facade of this mantel. This beautifully designed fireplace mantel is decorated with candles in warm metallic holders. Extra firewood can serve as a decorative element in itself. This modern fireplace conveniently holds a space for storing extra wood which acts as a warming element in the space. Changing the color of your mantel can go a long way to determining the color story of your room when paired with other elements such as rugs or textiles. Even as a small, out of the way built in, your fireplace is still a significant part of your decor, from the brick inlay of the fireplace to the stack of well-loved books that decorate the mantel. Look for accessories for your mantel that have height and width to add drama to your design without taking up too much space. This modern, black fireplace creates a point of contrast that defines this otherwise monochromatic room. Another example of using the height and length of plants to create visual interest on a mantel. The line of black, white and metallic vases that line this mantel both tie the space to the larger room while making it a visual focal point. Not all of your mantel decor has to sit on your mantel. Hanging decorations on the wall over the can be just as effective. And if your fireplace doesn't have a mantel, it might be your only choice. Scandinavian design is the epitome of modern decor and there's nothing more modern than the stark beauty of this space complete with beautiful enclosed fireplace. The side alcove, loaded high with firewood, adds a touch of nature and a pop of warm color to the room. Classic fireplace architecture with a lovely contemporary twist. This stunning living room is accented perfectly by a mantel with just a few small decorations. Who says that all of the fire in your fireplace has to stay on the inside. This beautiful array of candles across the mantel and in the hearth create a truly breathtaking display. Candles can be a wonderful solution for bringing light and warmth to any faux fireplace. Perfect for spring, this room done all in white is highlighted by a traditional fireplace design topped by an ornate mirror. Designs in your mantel can be repeated throughout the room to create layers of pattern. Playing with scale, like placing a large mirror over a small mantel can turn an ordinary room feature into an eye-catching centerpiece. Rustic highlights like this brick feature can add an unexpected twist to your mantel decor. Another perfect springtime mantel with beautiful flowers. Use dramatic floral arrangements to add to the sculptured look of your mantel space. The creeping ivy turns this fireplace into a true showstopper. This room, all in warm shades and bright metallics is ideal for showing off the detailed architecture of your traditional mantel. This gorgeous built-in fireplace takes classic style from the floor all the way to the ceiling. Jus because you don't have a fireplace, it doesn't mean that you still can't enjoy beautiful mantel decor. With the right pieces you can create your own mantel to style and decorate. And best of all, no one has to chop any wood. Pretty in pink. This room uses the shade as a neutral, creating an eye-catching focal point with its colorful fireplace. Gorgeous, traditional china and an antique clock all enhance the nostalgic feel of this mantel. Whether it's a celebration of spring or an extra touch of decor for the holidays, a garland is always a welcome note to accent any mantel space. The wallpaper in this room is a perfect complement to the structure of the fireplace. When decorating your mantel, look at things from all sides to see how your mantel will interact with and support design elements elsewhere in the space. Unexpected elements like brick or wood panelling are an excellent way to give traditional fireplace designs a new spin. A beautiful rustic show space. The brick pattern of this fireplace meshes well with the geometric patterns of the other patterned elements in the room. Marble is an iconic staple of home decor and there are few places where the stone is put to better use than in the mantel. A row of vases and figures like those seen here are sure to interact beautifully with any fireplace boasting classic sculptural details. Interesting colors, like this dark gray, can go a long way to bring interest to your fireplace, particularly when combined with other elements, like the marble seen here. This mantel combines natural influences and manufactured metallics for a balanced look that easily becomes the centerpiece of the space. The warmth of the fire in this space is picked up by the warm wood and metallic tones found throughout the room. They give the space a warm look even when the fire's out. A line of candles mirrors the bright crackling fire in this rustic and rough-hewn fireplace. This moody tableau mixes deep, rich color with hints of nature and an array of interesting statues to set the tone for a very interesting room. Metallic busts with a global feel, a towering, manicured plant and sculpted details throughout the structure make this fireplace mantel an irresistible centerpiece for this well designed room.